I've heard SO many good things about the DockATot and I'm so excited to try it out. I always ended up co-sleeping with Ellie and Addie, so a DockATot is a dream come true - it's breathable and I can't roll over it! 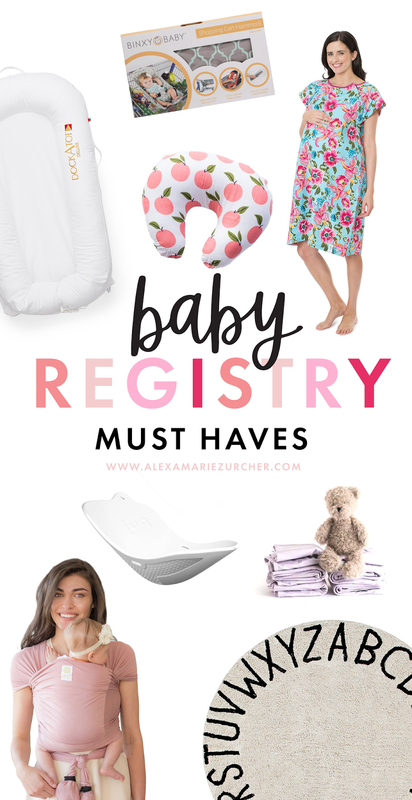 It's also super portable - so if you're planning on having your baby in bed with you (or even just need a place for naps or playtime) or need something easy for travel - add this to your registry! I LOVED carrying my first two babies in a wrap, and this blush pink one was just calling my name! It's so helpful to have a wrap so you have two hands available and the LILLEbaby wraps and carriers come in so many different colors and patterns. This is something I wish I had with Ellie and Addie. The car seats take up SO much room in the grocery carts, it's like a tetris game trying to fit in all the groceries and random things I find at Target. :) This hammock looks darling, holds your car seat or baby, fits into most carts, and would make a perfect baby shower gift! Yes, I said washable! A mother's dream come true. All the lovely bodily fluids and crumbs and messes that come with having kids can now be washed right out at home! I love this alphabet rug. I picked this tub up after several recommendations from friends. It's sleek and fits perfectly in our sink - and I don't have to bend over the tub for bath time now! And other registry ideas: a car seat and stroller (we love our city select double stroller and chico carseat). And of course, burp cloths, pacifiers, and outfits. Can't forget a few cute outfits! What do you wish you had added to your baby registry?